The Terea from Luxo “combines energy-efficient LEDs, ergonomics and compact design for an incomparable value. Terea, which efficiently and cost-effectively illuminates any work surface with maintenance-free operation, better articulates its ergonomics with the effortless tilt of its arm and complete flexibility of its head. 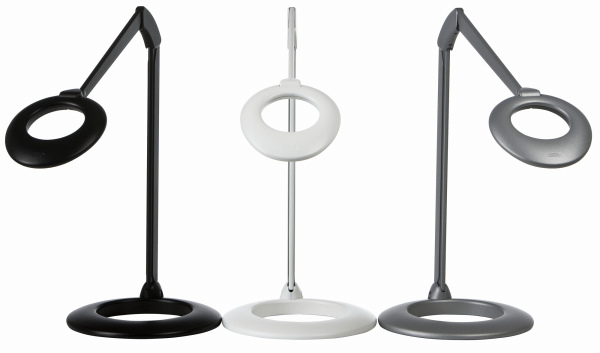 This allows the light to fall asymmetrically across the work surface providing optimal lighting and functionality”. I also enjoy the modern look and feel it brings to the desktop. The Ovelo from Luxo is a “uniquely designed LED task light for the modern office. 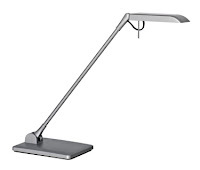 Complete with a timer which automatically turns the light off after 9 hours of use to ensure energy savings, this task light uses 6W dimmable LEDs to illuminate an entire work surface. A combination aluminum and steel construction and covered spring-balanced arm provides complete flexibility of the pivoting arm and lamp head”. It kind of looks like a classy donut…but I love it! The Pisa by Details “is a uniquely designed free-standing, incandescent task light. Pisa leans up to 20 degrees in any direction to position light where you need it most. Making it useful as a lighting supplement in a workstation or wherever direct light is hard to get”. It was one of the first desk lamps I saw in the offce and fell in love with it’s cool color and “home-like” design. And lastly, but certainly not least, is the Dash Light by Details. “Designed in collaboration with Foster + partners – the new dash LED Task Light is as much about improving how we work as it is about making a subtle statement with its design. Featuring clean lines, fluid movement and a timeless aesthetic, dash provides optimal lighting in nearly every environment. Yielding a soft consistent pool of light which “falls off” considerably less than other LED lamps. It is the ﬁrst freestanding LED task lamp to achieve BIFMA Level 1 certification – utilizing a mercury-free LED and a wireless current to eliminate PVC. Use dash to complete a space or define it. The freedom is yours”. They have so many colors to chose from…who wouldn’t want a desk lamp with a colorway of Wasabi? I may have to go commandeer one of the showroom samples of these task lights for my space…but which one to choose?? ?